The ultimate oil-free, vitamin-rich serum that nourishes skin and protects from ground-level ozone (O3) or air pollution. Our potent, plant-based serum complex is infused with vitamins B5, B3, C and hyaluronic acid. 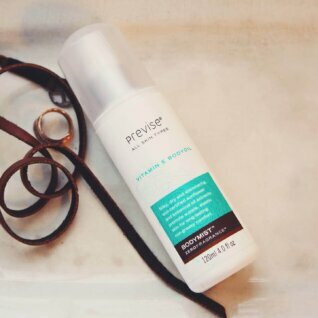 B5 and hyaluronic acid help bind moisture to the skin to lockout airborne pollutants. Vitamins B3 and C help fight oxidative damage. Safe for extra-sensitive areas around your eyes. Clinically tested, Swedish-American dermatology skincare crafted from plant-based ingredients. Our vegan formulas use the power of nature to help you achieve and maintain youthful, glowing skin. Sodium Hyaluronate [HA] acts as a humectant to draw and bind moisture to the skin. 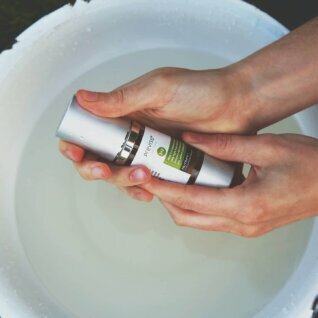 This powerful ingredient helps your skin retain moisture while reducing trans-epidermal water loss; water loss due to low-humidity, delicate or aged skin. As we age our eyelids lose elasticity. HA helps reduce plumping the skin to reduce the appearance of fine lines and wrinkles. Panthenol (Vitamin B5) a provitamin and part of the powerful B-complex vitamin family. When applied topically vitamin B5 aids in moisturizing, soothing, and healing skin. Healthy skin regenerates more vigorously, is soft, smooth and more even toned. Vitamin B5 provides superior protection from everyday challenges of the environment. As a humectant, vitamin B5 helps stabilize the epidermis or skin barrier function. This helps to reduce the amount of water lost through the skin. Niacinamide (Vitamin B3) works to strengthen the epidermis or skin barrier by encouraging the production of ceramides. Skin ceramides act as the glue that binds together protective cells in the outermost skin layer [epidermis], the stratum corner. Loss of skin ceramides can leave skin dry, rough, and itchy; a major contributor to wrinkles. 3-O-ethyl ascorbic acid (Vitamin C) aids in collagen production and maintenance. Vitamin C is one of the most potents antioxidant that neutralize free radicals in the skin. A powerhouse ingredient, vitamin C is shown to help reduce skin inflammation, irregular pigmentation, and promote healthy collagen production. Cynara Scolymus (Artichoke) Leaf Extract is rich in Cynaropicrin. 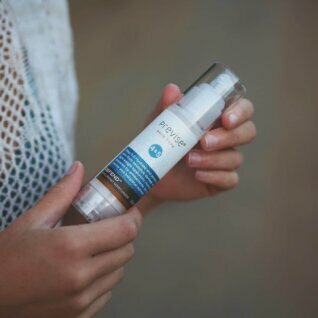 Clinical studies show cynaropicrin can help interrupt photo-aging or the proliferation of keratinocytes and melanocytes which cause wrinkles and pigmentation. Research demonstrated that cynaropicrin essentially inhibited excessive activation of the “Nuclear factor kappa B” or (NF-κB). It is the excessive activation which is shown to be a causative factor in photo-aging. Camellia Sinensis (Green Tea) contains polyphenols. These bioflavinoids offer antioxidant and antibacterial benefit, plus aid in reducing inflammation. Airless pumps dispenses serum using vacuum technology. Depressing the pump creates a vacuum effect to draw the serum upwards without the use of a dispensing tube. Helps ensure all product is used without waste, which is a problem with standard pumps. Water, Saccharide Isomerate, Algae Extract, Chondrus Crispus Extract, Sodium Hyaluronate, Camellia Sinensis (Green Tea) Leaf Extract, Panthenol (vitamin B5), Niacinamide (vitamin B3), 3-O-ethyl ascorbic acid (vitamin C), Triticum Vulgare (Wheat) Germ Extract, Yeast Extract, Cynara Scolymus (Artichoke) Leaf Extract, Glycerin, Xanthan Gum, Citric Acid, Silver Citrate. Apply Nutrify Ozone Defense Serum after cleansing with Purify Marine Cleanser. Pump serum into the palm of your hand. Massage serum across your forehead and into the hairline. Then massage serum down your cheeks, across your nose, and into your upper lip area. Using your palms massage remaining solution across your jaw line and chin, down your neck, and across the back of your neck. Pump a small amount of serum and closing your eyes, gently press serum into the upper and lower eyelid area. Will Nutrify penetrated oil-based moisturizers? Actually Nutrify is oil-free so it must not be applied after before any moisturizer that contains natural oil, silicone or synthetic oil hybrids. The vitamins, botanicals and hyaluronate will not past those barriers. No. Though Ozone Defense contains a potent blend of vitamins, antioxidants + hydrating ingredients it is not occlusive. Nutrify will not form a the same moisture barrier to the skin as a heavy or light-weight cream. We recommend our HydroBalm or HydroMilk as moisturizer.